Is there anything worse than realizing your air conditioner isn’t working on one of the hottest days of the year? 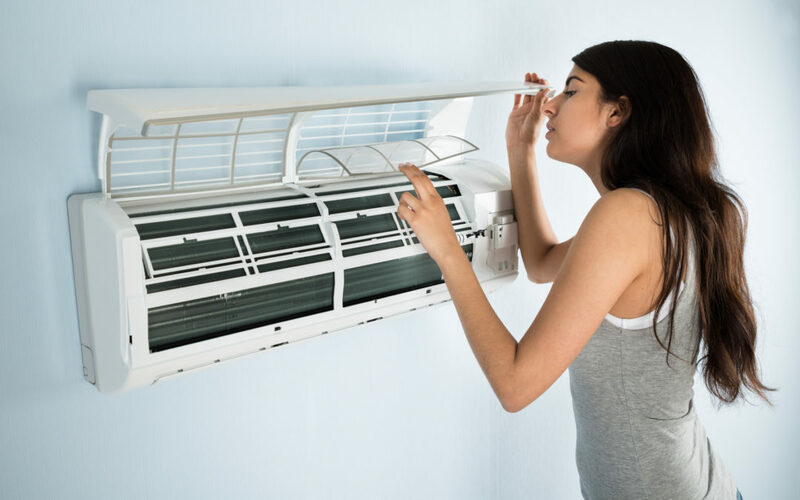 Air conditioning problems can make your home unbearably hot and force you to make costly repairs to your AC unit right away, even if you haven’t had the time to plan for them. If your AC isn’t kicking on and cooling down your home like it used to, there are a number of issues that could be affecting it. The reason for your air conditioning problems could be something as simple as your thermostat being set improperly or as complex as your AC compressor conking out on you. Fortunately, routine maintenance of your AC unit can usually keep these air conditioning problems at bay. But it probably won’t eliminate problems altogether. Check out 8 common AC problems homeowners deal with on a regular basis. All air conditioners contain refrigerant that is used to cool down the air that passes through them. When this refrigerant runs low for whatever reason, the air produced by an AC unit will be warm, not cool. Leaking refrigerant is one of the most common air conditioning problems. It’s also a problem that many people “fix” by simply refilling the refrigerant. You should never take care of a refrigerant leak by asking an AC technician to refill it since that won’t take care of the issue. Your AC will continue to leak refrigerant, and it won’t put out the cool air you’re looking for. If you have a leak, you should call on a professional to get to the root of the problem and fix the leak so that your refrigerant remains in your unit. This will allow it to do its job and keep your home cool. Like most machines, your air conditioner is a complex system of different parts that all work together to get a job done. If one of those parts is worn out, the entire system will fail, and it won’t be able to cool your home. The compressor and fan controls can present air conditioning problems for you. If you have an AC that is constantly turning on and off–which is an issue for many homeowners with oversized units–you will likely wear out your compressor and fan before long. If you hear any strange sounds coming from your air conditioner this spring or summer, it’s a good idea to have a professional check it out right away. By replacing your compressor or fan controls now, you can avoid having to replace your whole system later. You would be surprised by how many people have air conditioning problems that are directly tied to their air filters. Your air filter is in charge of taking the air that moves through your AC unit and cleaning it. This air filter should be changed about once every three months, depending on the specific type of filter you buy. If you don’t change your air filter regularly and you allow dirt, dust, and debris to build up in it, it will affect your home’s air quality. It will also force your AC to work entirely too hard and make it less efficient. By replacing your air filter regularly, you can avoid quite a few air conditioning problems. You can also keep your home cleaner as a whole and ensure you’re breathing in the cleanest air possible at all times. Many times, homeowners try and disguise the AC compressor located outside of their home by surrounding it with plants. And while this isn’t the worst idea in the world, you do need to be mindful about how many plants you’re placing around the compressor. In general, an outdoor AC compressor for a central air conditioning system needs about 2 or 3 feet of space between itself and plants in order to function properly. Additionally, there should be about 5 feet of space between the top of the compressor and any plants or trees. If you have plants surrounding your compressor, you could be affecting your unit’s airflow and causing air conditioning problems by preventing air from getting through to your AC. You should make sure your trim trees and plants around your compressor so that they don’t affect the temperature of your home. You should also consider the types of plants you place around an AC compressor before you get them into the ground. There are so many Americans who spend so little time checking out their thermostat and how it works. Most take the “set it and forget it” approach to heating and cooling their homes and then wonder why it’s never as comfortable as they want it to be. If you have a programmable thermostat, you should take the time to learn how to set the temperature correctly with it. You should set it so that it’s cool and comfortable when you’re at home and slightly warmer when you’re not. Doing this can save you a lot of money every year on heating and cooling costs. It can also ensure that your thermostat is set to your desired level throughout each day. No matter how big or small they are, all air conditioners have a multitude of electrical connections and electrical contacts stuffed inside of them. The wires and terminals inside your AC play an important role in how well it works. Over time, wires and contacts can corrode and cause air conditioning problems when they do. In some cases, small animals can also work their way into an AC unit and chew away at important wires. If your AC unit ever stops working suddenly and doesn’t seem to have any power to it, there’s a chance you have sustained damage to the electrical connections. A professional will have to repair or replace them to get your unit up and going again. One of the biggest air conditioning problems doesn’t have anything to do with your AC unit at all. There are some people who maintain their AC units regularly, learn how to control their thermostats masterfully, and have repairs made to their air conditioners religiously and still can’t seem to cool their homes down. It could be several things, but in all likelihood, the issue probably has to do with the insulation in your home. That could mean you don’t have enough insulation behind the walls of your home, which can cause cool air to leak out of your house. It could also mean you don’t have enough insulation in your attic, which can cause cool air to find its way into that particular space. You might also have older windows in your home that are allowing cool air to escape and forcing your AC to work way harder than it has to. At any rate, if you suspect a lack of insulation could be causing air conditioning problems, you should have it checked out right away. You might be paying exorbitant cooling costs and suffering from a hot home in the summertime for no reason. By insulating your home better, you can enjoy the cool air your AC unit produces longer. Are you having a cooling company come out to your home at least once every year to check out your AC for air conditioning problems? If you’re not, that might be your biggest problem of all. You might not be thrilled about the idea of having your AC inspected annually. But if you opt not to do it, it could lead to big issues later. Having your AC unit cleaned and examined before you start using it every day is the responsible thing to do. You should form a relationship with an HVAC company in your area and schedule yearly maintenance on your AC unit. Whether you choose to do it first thing in the spring when you’re preparing to use your AC or at the end of the fall when you’re done using it for the year, it will be well worth the investment. You can avoid most air conditioning problems by having an inspection done. You will be glad you did when your AC is kicking out cold air all summer long. Are you tired of living with an air conditioner that doesn’t work as well as it should? You can take care of your problem with one call. Allow us to service your air conditioner and fix whatever is wrong with it. Check out our blog for more tips on knowing when it’s time to schedule maintenance on your air conditioner.